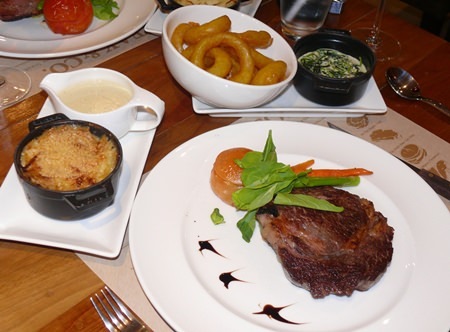 Home Lifestyle Dining Out Steak & Co. – an Enigma? Steak & Co. – an Enigma? Pattaya is an amazing city. New businesses seem to pop up overnight and new restaurants as well, but then close before their grand opening. However, there are some that will survive, and Steak & Co. is in that group. 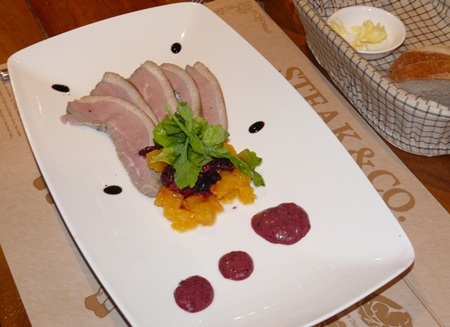 Going now for three months, Steak & Co. is where the China Garden restaurant used to be in Soi Leng Kee, but the venue has been totally re-furbished in a bistro style. The venue has bench seating along the walls, with generous sized tables and comfortable chairs. At the front there is an open air section for smokers and people watchers, leading into the fully air-conditioned restaurant proper. 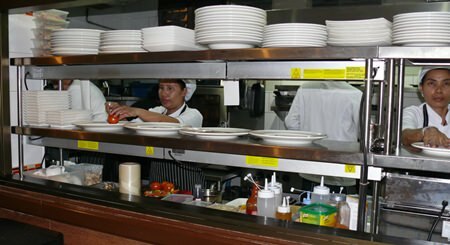 There is an open kitchen at the back of the house, the lair of Scottish executive chef Gerry Graham, while the front of house is watched over by the Ukrainian manager Yuriy. The service personnel are in uniform, welcoming and obviously well trained. When you are seated, you are presented with placemats showing the different cuts of meat from an Aberdeen Angus, and even suggestions as to how the steaks should be cooked. The menu is quite substantial, and begins with a historical background showing just how animals from Aberdeen in Scotland came to be roaming all over Australia, with 62,000 calves registered with Angus Australia in 2010. These can be traced back to “Old Granny” which was born in 1824, living to 35 years of age and producing 29 calves. A formidable Old Granny indeed! The wine list is predominantly Australian and under B. 1,000 per bottle or around B. 220 per glass. Sixteen starters (B. 195-295) cover soups and salads and a crab and avocado which interested me. The next section is steaks with 11 choices. Many give you the option of 200 gm or 400 gm, and come with a choice of sides and sauces. The smaller steaks range between B. 495-695, while the larger cuts are B. 895-995. There is another section called Mains (generally around B. 375), with pork, beef, chicken, lamb and even a steak and ale pie. Burgers follow B. 295-365, Mussels (B. 395) and then six Thai favorites (B. 160). We began with the crab and avocado starter for me, and the smoked duck with raspberry vinaigrette for Madame. We both enjoyed these and then we attacked our steaks. A ‘blue’ Angus rib-eye for Madame and a med/rare fillet mignon for me. Both presented exactly as ordered. Top marks again! Scottish people are not renowned as being demonstrable in the Italian way; however, Chef Gerry is the exception to the rule, speaking passionately about his food and how it should be prepared, cooked and presented, right down to the need for warmed plates for his steaks. When it came to desserts, it was apparent that chef Gerry was not going to let us out without trying his tiramisu, which was excellent. 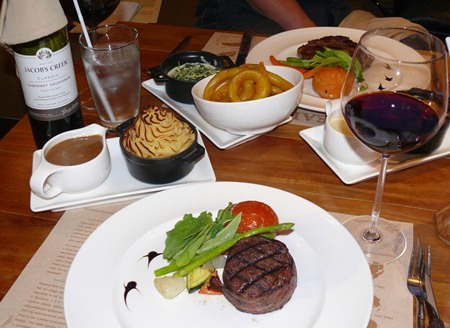 We found the portions very large, and unless you have a very large appetite, go for the smaller cuts of beef. 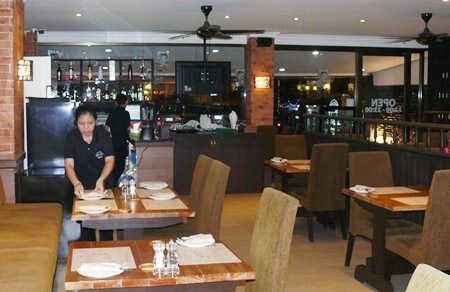 The food was top class, and would hold its own in any of the fine dining restaurants in Pattaya. We both decided that this restaurant was an enigma. Bistro style venue but totally up-market food. The prices are reasonable and this restaurant gets a very high recommendation. Definitely worth the trip, though parking can be a problem. Best to park on Third Road and walk down Soi Leng Kee. On leaving Steak & Co. with its emphasis on Aussie beef, I walked up the road and couldn’t help dropping in to the Ned Kelly bar (Australia’s most remembered bush ranger) and listening to AC/DC numbers (Australia’s most remembered rock and roll band). It was that kind of Aussie night! Steak & Co., 312/53-54 Moo 9 Soi Leng Kee, telephone 038 425 001, mobile (chef Gerry) 098 738 7453), hours 12 noon until 11 p.m., seven days, on-street parking.